There is a secret hidden language of flowers that most people do not comprehend. Each flower has its own meaning; depending upon the color of a flower the symbolism can change to a whole new definition. When choosing a floral arrangement for a gift it’s important to understand what exactly is being proclaimed with the flowers selected. There are several flowers that stand for dignity, and these blossoms would make an excellent choice for a number of ceremonies. 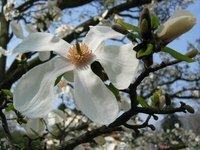 The magnolia flower is a pure white, pink or purple flower that is large and elegant. The flower is about 3 to 12 inches in diameter surrounded by dark green foliage and grows from an evergreen plant. This flower is the symbol of dignity, according to iFlorist, and is widely used in floral arrangements, corsages and hair accessories. The magnolia is the official state flower of neighboring southern states Louisiana and Mississippi. Artemesia are a group of landscaping perennial plants that include mugwort, sagebrush and wormwood. These plants have silver to grey colored foliage with yellowish white or whitish green flowers in the summer. This plant is mainly used for medicinal and herb purpose. The plants foliage is dried and used in Christmas wreaths. Flower-CS states that the Artemesia plants’ floral meaning is dignity. The Nevada state flower is the sagebrush, also known as Artemisia tridentate. Dahlias are a glamorous garden plant with brilliantly colored large dinner plate sized flowers. There are varieties that have single one inch blossoms as well. There are 30 different species of the Dahlia plant. This plant is used as a bedding plant in gardens and used in floral arrangements. The Dahlia is Mexico’s national flower, the official flower of the city of Seattle, and has a floral definition of dignity, according to romancestuck.com. The clove flower comes from the tropical clove evergreen tree, which is native to Indonesia. The flower starts off a pale green and once matured transforms into a bright red. This flower’s spike-shaped bud is the ingredient for the spice cloves. According to Oregon State University, it takes 4,000 to 7,000 of these flower buds to make just 1 pound of the spice. The clove flower is an symbol for dignity, says Flower-CS. The gladiolus family has around 260 species of flowers available in colors that span the rainbow. They are perennial herb plants that grow from croms which are short thick stems that grow from the base of a plant. Gladiolus flowers flourish from the croms and are surrounded by a couple of leather like dark green leaves. This plant is used for medicinal purposes, floral arrangements and is also the birth flower for the month of August. The gladiolus flower represents strength of character, a form of dignity. What Flowers Can Be Arranged With Sunflowers? Can I Spray My Floral Arrangement With Glaze?